Are Paint Fumes Bad for Pets? 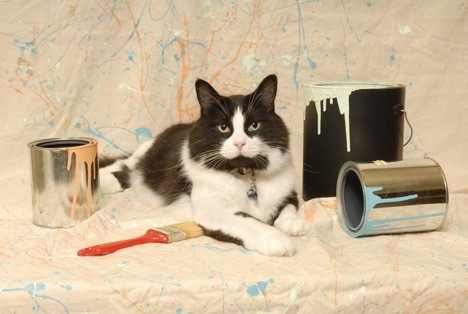 If you’re going to paint at home, it’s important to know how paint fumes can affect your pets. Even though dogs and cats may be able to move away from a smell they don’t like easily, other pets, such as ferrets and guinea pigs, are contained to where you leave them. Any kind of house paint can be dangerous for pets. You may open a gallon of paint inside of a room with the intention of going to get supplies. Animals are naturally curious, and that can get them into trouble, especially free-roaming pets like cats and dogs. These pets may sniff or even lick an open can of paint, which can make them very sick. Be sure that you keep pets out of the room when you’re painting, if at all possible. Otherwise, place the paint higher than they can reach. Paint can be extremely toxic. How much is too much is dependent on the size and weight of the pet. This means that smaller animals, such as reptiles and hamsters, can be affected by even a tiny amount of paint. As for paint fumes, these, too, can be toxic. Fumes are not only bad for dogs and cats, but they can be lethal for birds, hamsters and other small animals. Snakes and other reptiles only have one lung, making them considerably more vulnerable to fumes, too. Remember that just because you can’t smell the paint fumes any more doesn’t mean that your pet can’t still get sick from inhaling them. There are a lot of ways that you can protect your pets when you decide to take on a painting project in the house. The first thing to do is to use non-VOC paints. Low and zero VOC paints will promote a healthier indoor air quality when you’re painting. The fumes will be minimal. It’s also important to offer a significant amount of ventilation. Open all of the windows in the area that you’re working in. Turn on fans so that the air continually circulates while you paint. Curious free-roaming pets and smaller animals may need to be boarded as a precaution. Removing them from the house while you paint can make it easier for you to get the work done without wondering if your pets are staying safe. You can be a good pet parent by knowing about the dangers of pet fumes. If you decide to paint while your pets are in the home, be sure that you take the necessary precautions. That way, you can make sure that they’re kept safe throughout your home renovation project. Sometimes life gets busy, and it can be tough to keep up with the needs of your pets. That’s where Paternal Pet Care comes in! Get in contact with us, and see how we can help! Read This Before You Sneak Your Pup That Snack!